Congratulations to the Tolkien Gateway! I have found that the Tolkien Gateway is generally reasonably reliable – more so, certainly, than other encyclopaedic web-sites. I will still, however, caution anyone to never trust an on-line resource without double-checking with material in print (and yes, that also applies to anything written by myself). All in the spirit of good fun, I'm sure. Though why they'd use deer as a model for Elves is beyond me – Tolkien's Elves hunt deer! (And, though not the fault of the students, I start getting an allergic reaction to anyone writing about “Lembas bread”). As I have said elsewhere, I rather suspect that Jackson strongly underestimates the vituperation of Tolkien's reaction to his films, but we are fortunately not obliged to agree with Tolkien (just spare me fools who cannot tell the two apart). Having Tolkien's original dust jacket design for The Hobbit on display in the ‘Marks of Genius’ exhibition, the Bodleian Library has invited Stuart Lee to talk about Tolkien's writing of the book. An overview article about Anglo-Saxon ideas about magic. Quite interesting. On the appearance of Tolkien and The Lord of the Rings in 1970 academic work by L.W. Forster, in which Forster makes it clear that he has been discussing the emergence of the mythology with Tolkien. Good finding, there! At another level, I cannot help but wonder if we are allowing ourselves to be blinded by Tolkien's statements about the philological / linguistic origin of his mythology. When you study the actual writings, it seems to be a more complex thing, where poetic or narrative necessity gave rise to linguistic invention, which then, again, inspired more poetic and narrative work. An essay from the book Folklore in Old Norse – Old Norse in Folklore, edited by Daniel Sävborg and Karen Bek-Pedersen. Let me hasten to assure everyone that the author does not claim to provide a full or exhaustive answer. What he does give is ”the two-minute version”. Unfortunately he doesn't really bring his perspective of a game design consultant into play, focusing on the depth of Tolkien's sub-creation. Nothing new, really, and some inaccuracies along the way, but still they have at least tried to make an effort and this is no worse than most such synopses and better than many. A pity that their main source, one Tim Machan (a ‘historical linguist’; is that the same as a philologist? I am not entirely sure of the details of these distinctions), seems to be unaware of the serious Tolkien research that is going on – including Ph.D. (and other) theses focusing on Tolkien (or Tolkien's relation to something else: author, philosopher, movement, etc.). 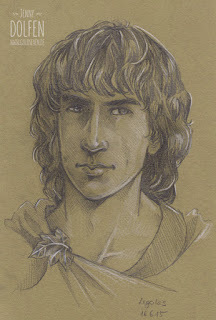 An interesting analysis of The Children of Húrin in which Ben invokes the nostalgic pain that Michael Drout mentions in his paper, ‘The tower and the ruin: the past in J.R.R. Tolkien's works’ in J.R.R. Tolkien: the Forest and the City, and for which Drout uses the German word Heimweh (I admit that I find it a little difficult to see this word, meaning simple homesickness, used in this way – possibly because we use the same word in Danish with the same meaning). However, with the Narn specifically, I would argue that the sense of pain is immanently different as it is not, in my opinion, the pain resulting from the loss of the past, but rather a pain resulting from the loss of a future, of that which might have been rather than that which was. The group is presently on the second book of The Lord of the Rings with this report dealing with chapter 4, ‘A Journey in the Dark’. Two briefer items precede the linked post. About the upcoming publication of Tolkien's Story of Kullervo edited by Verlyn Flieger. E.L. Risden's review of last year's main Tolkien publication, Beowulf: A Translation and Commentary. Issue 7 of Gramarye as been published by the Sussex Centre for Folklore, Fairy Tales and Fantasy. Besides other material, this issue includes a review of Tolkien's Beowulf by Tom Shippey, and other reviews by Alaric Hall of J.R.R. Tolkien: The Forest and the City, and by Jane Carroll of The Riddles of the Hobbit. The article ‘They Say England Has No Folktales’ by Jacqueline Simpson may also be of particular interest to people interested in Tolkien specifically. by Joseph Loconte, and C.S. Lewis & His Circle: Essays and Memoirs from the Oxford C.S. Lewis Society edited by Roger White, Judith Wolfe, and Brendan A. Wolfe. Though the title, despite its succinct phrasing, manages to light up two of my red lights (“must-read” and “Tolkien fans”), I find that this review from a Tolkien reader of The Children of Húrin is written with a fine balance of passion and humour. all the Company of the Ring. 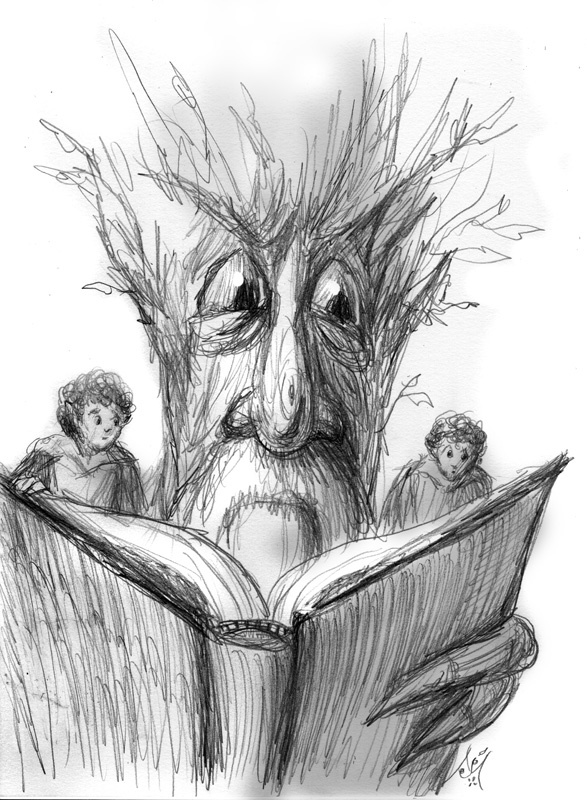 Jef Murray's illustration for the 2015 Tolkien Reading Day on March 25th with the theme ‘Friendship’. 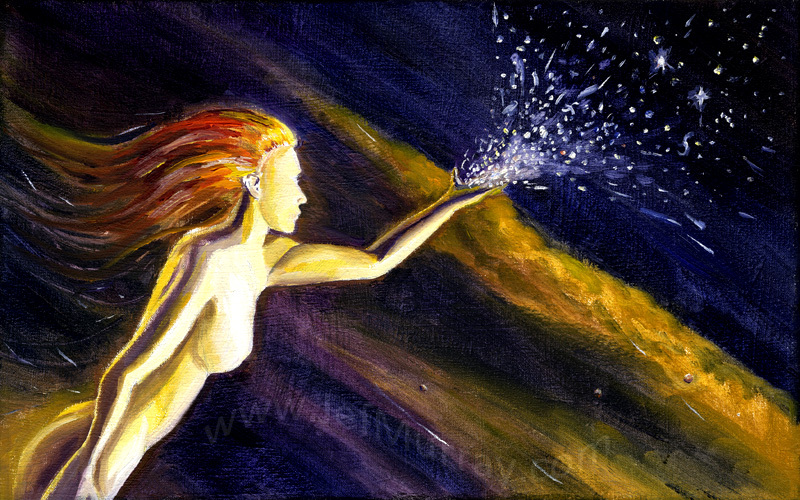 Another of the women from Túrin's life (remember Jenny's picture of Nienor from last month). Oh, and I won an A4 print in the June monthly raffle on Jenny Dolfen's Patreon page! Go Jenny! Go me! :-) To have your own chance of winning delicious Dolfen designs, support Jenny at Patreon.com. Descriptions, objectives, schedule and more for a summer class at Bemidji State University. Seven chapters from Splintered Light in a single week ... personally I think I digested it at a slightly more leisured pace. Jason Fisher has been been blogging on Lingwë for 8 years. A healthy dose of gratitude goes to Jason for his effort, which has produced many highly interesting posts! Then there are news about books and awards (Fisher has become a fixture as a contributor to finalists for the Mythopoeic Scholarship Award in Inklings Studies – congratulations on that, it is very well deserved! ), and about “a special conference next spring”. Probably a bit outside the normal scope of these transactions, but an excellent example of how Tolkien is being used in various contexts to promote various viewpoints. I rather suspect that Tolkien would not mind being used to promote a papal encyclical, though. Emil Johansson has made a very fine hand-drawn map of Middle-earth based on Christopher Tolkien's original artwork. Ben here comments on another case of Tolkien being used to make a point that has nothing whatsoever to do with his work or person (neither his biography, scholarhip, fiction, poetry or artwork). I have not yet had time to perouse this latest issue of Parma Eldalamberon, but I will look forward to having a look. Though, admittedly, much of the linguistic contents of the Parma Eldalamberon tends to go over my head, but not only is there usually some interesting tidbits hiding in the linguistic discussions, but getting some sense of Tolkien's linguistic / philological preoccupations is, I firmly believe, necessary for me to increase my understanding of the great author. This issue with information about the upcoming Mythcon (q.v.) 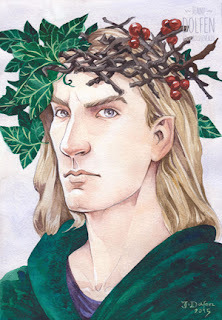 and a report from the annual Tolkien in Vermont conference by Gerry Blair, and on the University of New Mexico Hobbit Society's annual spring colloquium, Intellectual Hooliganism, on 1 April 2015. The reviews in this issue are not Tolkien related. The item in this issue that stood out for me was the forteenth installment in Dale Nelson's series on the Days of the Craze – this time subtitled ‘WH Auden on Tolkien's “Hideous” House’. From an article on Medievalist.net to her web-site. There are a number of interesting articles and other stuff here, so go look around. Remember to check out the full archive of posts from June 2015!